Butterfly hinges, or surface mount cabinet hinges, attach to the outside of cabinet doors so the full hinge is visible when the doors are closed. 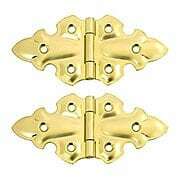 Available in solid brass and cast iron, these flush mount hinges will add an attractive accent to any cabinet. Streamline style for the modern home! 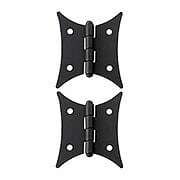 Dating from the 1930s, these sleek surface hinges are an Art Deco classic. Reproduced in solid brass with our hand-applied antique finish. Slotted screws included. Jet-black iron hinges give your cabinets an authentic, Colonial flavor. Forged from solid iron, they have a smooth surface and a rust-resistant finish. 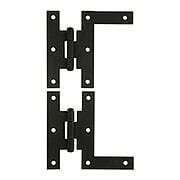 The pair includes one top and one bottom hinge (enough for one door), and are easily installed on flush mounted cabinet doors. Jet-black iron hinges give your cabinets an authentic, Colonial flavor. Forged from solid iron, they have a smooth surface and a rust-resistant finish. Reversible and easy to install on flush-mounted cabinet doors (pin is not removable). 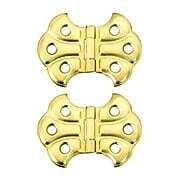 These Early-American Butterfly Hinges (2 1/4-Inch X 2-Inch) are as simple as can be. Based on the hand-wrought designs of Colonial blacksmiths, they are a distinctive alternative to H or strap-style cabinet hinges. Made of stamped steel with a satin-black, lacquer finish. 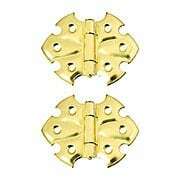 These Early American butterfly hinges are as simple as can be. Based on the hand-wrought designs of colonial blacksmiths, they are a distinctive alternative to "H" or strap style cabinet hinges. 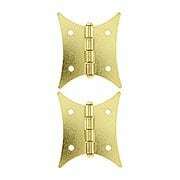 Made of stamped steel with a brass plated finish. Lacquered. 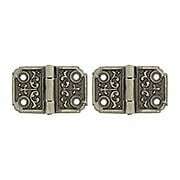 Dating from the high-Victorian era, these Gothic style hinges give your cabinets a distinctive flair. They are durable enough for your kitchen, yet elegant enough for your dining room. Reproduced in stamped steel with a plated finish. 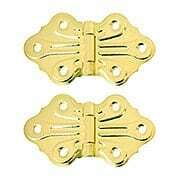 These delicate Butterfly Flush-Mount Cabinet Hinges (1 5/8-Inch x 2 7/8-Inch) were popular in the early 20th-century. Whether your kitchen is Victorian, Craftsman or Art Deco, it is an authentic period choice. Made of stamped steel with a plated finish. Reproduced from a circa 1900 original, these ornamental cabinet hinges are suited to Victorian or Arts & Crafts style interiors. Made the old fashioned way - from stamped steel with a plated finish. Flush mounted. 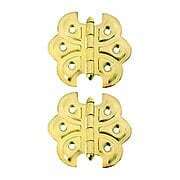 These delicate surface hinges bring to mind a graceful butterfly. Dating from the late Victorian era, they'll give your cabinets a charming vintage touch. Made of stamped steel with a plated finish. Flush mounted. 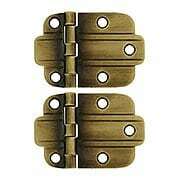 Simple and straightforward, these full surface cabinet hinges were popular in Craftsman style homes. Small in scale, they're suited to light or small flush mounted doors. Made the old fashioned way - in stamped steel with a plated finish. Ornamental cabinet hinges are a rarity today. This late Victorian design features a classic fleur-de-lis pattern, cast in solid iron. Antique iron finish with a lacquer coating. 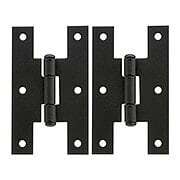 Our jet black Hand-Forged H-L Style Hinges (3-inch x 3-inch) give your cabinets an authentic, Colonial flavor. Forged from solid steel, they have a textured surface and rust resistant, powder-coated finish. 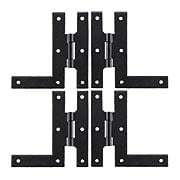 This set of four hinges includes two lefts and two rights. 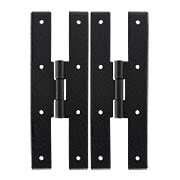 Our jet black Hand-Forged H-L Style Hinges (4-inch x 4-inch) give your cabinets an authentic, Colonial flavor. Forged from solid steel, they have a textured surface and rust resistant, powder-coated finish. 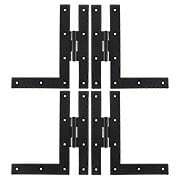 This set of four hinges includes two lefts and two rights. 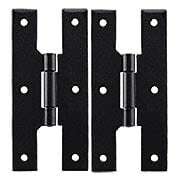 Our jet black Hand-Forged H-L Style Hinges (7-inch x 6 5/8-inch) give your cabinets an authentic, Colonial flavor. Forged from solid steel, they have a textured surface and rust resistant, powder-coated finish. 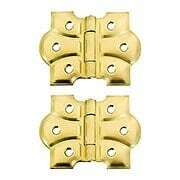 This set of four hinges includes two lefts and two rights. 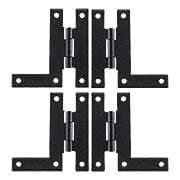 Our jet black Hand-Forged H-Style Hinges (3-inch x 1 1/2-inch) give your cabinets an authentic, Colonial flavor. Forged from solid steel, they have a textured surface and rust-resistant, powder-coated finish. Reversible and easy to install on flush-mounted cabinet doors. Pin is not removable. Our jet black Hand-Forged H-Style Hinges (4-inch x 1 7/8-inch) give your cabinets an authentic, Colonial flavor. Forged from solid steel, they have a textured surface and rust-resistant, powder-coated finish. Reversible and easy to install on flush-mounted cabinet doors. Pin is not removable. 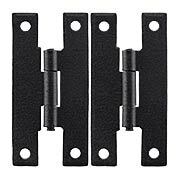 Our jet black Hand-Forged H-Style Hinges (7-inch x 2 5/8-inch) give your cabinets an authentic, Colonial flavor. Forged from solid steel, they have a textured surface and rust-resistant, powder-coated finish. Reversible and easy to install on flush-mounted cabinet doors. Pin is not removable.